Welcome to my new series called The Ingredient Exchange. Each week I will highlight a different ingredient and link to some of my favorite recipes. There will be thumbnail link at the bottom of each post so you can share your favorite recipes by ingredient. These links can be from your own blog or from another place, but the goal is to have a great list of recipes to pull from for each ingredient chosen. In addition, there will be a link to each week’s link ups on my Ingredient-Based Recipe Index so you can easily find them in one place. So…SPINACH. I thought it would be good to start off with something nice and healthy, because who couldn’t use a little more nutrients in their diet? Also, because I frequently find spinach on sale. You can opt for the fresh, or the frozen boxed spinach variety. I often get the frozen spinach for free by combining a sale with a coupon. 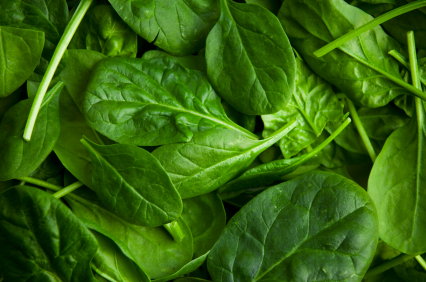 Depending on which type of spinach you have on hand, will dictate how you use it. This is my favorite breakfast. Not only am I getting a healthy breakfast, but I am getting my vegetables in, in the morning. Believe me this does not taste like it has fresh spinach in it! My kids even ask for it. I promise. I love salads, so when I find spinach on sale, that is my salad base for the week. This recipe is a great choice for a main course, I just a nice bread and I’m done. Since spinach wilts down a lot when cooked, this is how I use spinach that is about to expire. It is a good way to use a lot of spinach at one time. :: Checkout all of my favorite recipes using SPINACH. Have a recipe you would like to share either on your blog or elsewhere? If so, post the link below so that all the Faithful Provisions readers can easily find it. Be sure to make it easy to navigate by linking directly to your recipe post. Links going to the homepage of your blog or any other part of your blog besides the direct link to a recipe will be deleted. Posts promoting affiliate and referral links will be deleted. Tip: Post the recipe name you are linking to in the link title. For example, Beef Wellington. Also, be sure to pick the matching image, it makes it so much easier to visually find the recipe you are looking for! This is great and even the kids love it. Very simple and easy and if you don’t want to make your own sauce you can use jar sauce and it’s just as good and takes less time. * In a large saucepan, saute onion and garlic in oil until tender. Stir in the tomato sauce, tomato paste, water, wine, Italian seasoning, sugar and oregano. Bring to a boil. Reduce heat; simmer, uncovered, for 15-20 minutes, stirring occasionally. * Meanwhile, for filling, in a large bowl, beat cream cheese until smooth. Stir in the cottage cheese, spinach, Parmesan cheese, eggs and salt. * Stuff cream cheese mixture into uncooked manicotti shells. Spread 1 cup sauce into a 13-in. x 9-in. baking dish coated with cooking spay. Arrange manicotti over sauce. Pour remaining sauce over top. * Cover and bake at 350° for 50-55 minutes or until pasta is tender. Uncover; sprinkle with mozzarella cheese. Bake 5-10 minutes longer or until cheese is melted. Yield: 7 servings. Nutrition Facts: 2 stuffed manicotti equals 389 calories, 9 g fat (4 g saturated fat), 80 mg cholesterol, 722 mg sodium, 50 g carbohydrate, 5 g fiber, 25 g protein. Cook the Orzo according to package directions. About half way through the cook time of the Orzo, in a large pot or large pan, add about 1/8 cup of olive oil. Sautee garlic and pepper until pepper is softened but not mush. Once orzo is done, drain and add to pepper/garlic mix. Season with some salt and pepper. Mix up. Turn off heat, add spinach, cover for a few minutes (so spinach can wilt). Uncover and stir it all up and serve. It’s super light and tasty! Turn stove un high empty all contents into a pan mix often until blended & bubbling. Serve with white corn tortilla chips!